This entry was posted on Wednesday, April 19th, 2017 at 11:42 pm. I can’t believe the time has come, and we’re at the end of our History of Equestrian Style journey. We started at the top with the helmet and worked our way down. All that’s left is the history of riding boots, an incredibly important piece of riding attire that has, arguably, made the biggest impact on the non-equestrian world as well. The boot, in its somewhat current form, was created centuries ago, and its main function was to provide protection from the elements. They were usually made from leather, but other materials, such as wool, felt, silk, cotton, and even furs, were seen. Interestingly, the earliest known picture of the boot was found in a cave painting in Spain and is dated somewhere between 12,000 and 15,000 BC. A style similar to today’s riding boot would not appear until the 1600s. The seventeenth century saw the emergence of the first military uniforms, and the high-legged cavalier boot from the previous century was transformed into the highly-polished jackboot we’ve all seen in historical paintings. This particular style, with the high top and firm finish that was essential to protecting legs while on horseback, was seen in the late 1600s and continued to be worn until the 1760s. While the original structure of the boot remained, (distinct heel, firm toe, etc. ), this cavalier style boot received yet another makeover as the more gentlemanly pursuit of riding and foxhunting increased in popularity. The boot developed a softer and closer fit, described as the “jockey style,” with the top sometimes folded down under the knee. On the inside of the boot, a cotton or leather lining could be seen. In 1817, it was reported that the Duke of Wellington designed what became known as the “Wellington” boot. The Wellington resembled the Hessian boot, a light, high-tasseled leather boot worn by Hessian troops, but the Wellington was made from lighter calfskin leather and had a straight cut along the top with simpler binding. This boot became more of a sporting boot and was worn by foxhunters and jockeys, as well as grooms and butlers. The original Wellingtons were made from leather; however, in 1852 Hiram Hutchinson and Charles Goodyear, who had just invented rubber, developed the waterproof boot we currently think of when hearing the term Wellington or Wellies. By 1860, the original leather Wellington faded from popularity in England in favor of the short ankle boot; however, the style survived in the United States. It was widely thought that the Wellington contributed to the creation of the first cowboy boot, which is believed to have originated in the state of Kansas. 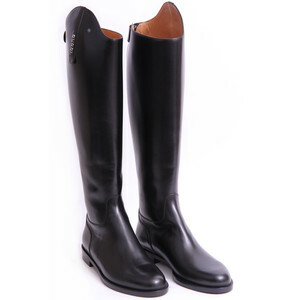 The modern riding boot has not undergone any significant changes, for the most part, since the turn of the century. The timeless, practically of its design has only needed minor adjustments. For example, one small change has been lowering the height of the heel; most boots now, with the exception of cowboy boots, have a heel of less than one inch. Leather is the main material that is used today, usually cowhide or pigskin, but synthetic leather and vinyl are seen as well. Patent leather is common for formal wear, especially for paddock boots. Of course, the quality of leather used varies with a softer leather increasing the value and price of the boot. It wouldn’t be a history lesson without learning a bit about the differences between current styles, which often dictate the discipline. We’ll start with the field boot, which is a tall boot with laces. These boots received their name as they were traditionally worn by officers ranked “field grade” or higher, and are now seen mostly in all jumping disciplines. The laces allow for some give and flexibility at the ankle, providing the rider more comfort while riding in shorter stirrups, which are needed for work over fences. Field boots are mostly black, but do come in brown, and are also worn by mounted police officers. Tall brown boots were fairly popular prior to World War II, but they are now considered casual attire and, therefore, are usually not permitted at horse shows. Dress boots are also tall boots but do not have laces at the ankle. 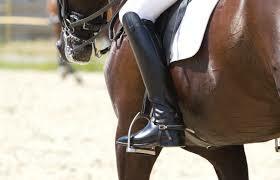 Due to this, the dress boot is usually stiffer and worn by dressage riders and during formal foxhunts. These boots are customarily black in color. Hunt boots, or Top boots, are very similar to the dress boot, minus the cuff at the top. The main portion of the boot is black, but the top cuff is tan or very light brown. Hunt or Top boots are usually worn by male foxhunters. Finally, we will finish with paddock boots, also known as Jodhpur boots. These are short boots, coming just above the ankle, and are typically used for pleasure and everyday riding except in Saddle Seat, where they are mandatory. Children showing in hunt seat disciplines wear paddock boots combined with a garter strap, or Jodphur strap, and graduate to tall boots when they are closer to adulthood. These boots are perfect when worn with Jodphurs as the pants finish at the ankle, unlike breeches which finish mid-calf. Many boots, tall and paddock, have an extra layer of leather on the toe, which is called a toe cap. Additionally, some styles of each incorporate zippers instead of laces, which eliminates the need for boot hooks. As we’ve all seen, equestrian attire appears frequently in mainstream fashion, but no piece is replicated quite like the boot. From high-end designers to your local discount shoe warehouse, all carry numerous variations of the classic riding boot. Color, material, and heel type and height may differ, but their origins are the same. Both practical and fashionable, the riding boot – for equestrians and non-equestrians alike – is here to stay. Well, as they say, “all good things must come to an end,” and we have reached the conclusion of the History of Equestrian Style. I hope you have enjoyed following along and learning about the origins of some of our favorite clothing pieces as much as I have. Looking back, I wonder what the mainstream fashion market would look like without our fellow equestrians paving the way with their classic and timeless sense of style. I have also learned that no matter the time or place, equestrian style has and will continue to evolve. While it’s an absolutely incredible time to be an equestrian, I do look forward to the ever-changing riding fashions to come!